Square Enix presents a brilliantly grim rendition of the Final Fantasy series. Prepare for war in Square Enix’s highly anticipated remake of Final Fantasy Type-0. Originally a Japanese exclusive made for the PlayStation Portable, Final Fantasy Type-0 brings a darker approach to the Final Fantasy lore that we all know and love. In retrospect, the mature label on this game is rather fitting due to its militaristic storyline. For those of you who haven’t played Type-0 and have doubts playing another Final Fantasy game after playing the XIII series, allow me to put your thoughts at ease. Square Enix strays from its usual turn-based battle system to a visceral, fast-paced action RPG style. With 14 playable characters to choose from and the ability to freely customize your party, Final Fantasy Type-0 delivers hours upon hours of gameplay as you step into the fray as Class Zero. The story regales players with the legend of Orience, a realm divided between four nations each with a mystic crystal as their power source. While the opening cinematic runs for approximately 15-20 minutes, it’s actually relevant to the story’s plot. An advanced military empire seeking to expand its territory decides to strike first at one of their most dangerous adversaries, Rubrum, the nation of mages. At this point in the game, players witness thrilling fight scenes of the scholars defending their territory against the enemy by casting fire spells to incinerate their enemies and summon Bahamut himself to sink airstrike vehicles. Rubrum appeared to have the combat advantage until the Empire deployed a device that disconnected the mages from their magic. Without the power of the crystal, they were powerless to the Empire’s cavalry. When all seemed lost for the mages, Class Zero joins the fray to reclaim Rubrum from the clutches of the Empire. 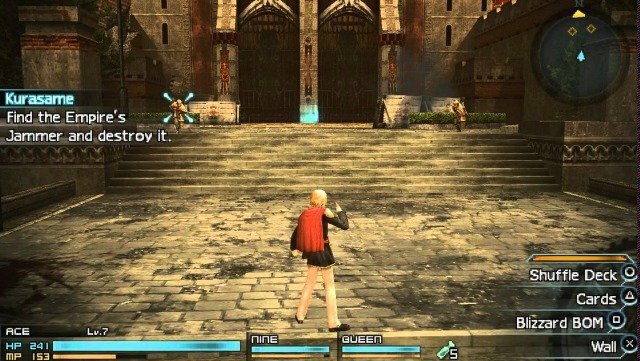 Now at this part in the game, players take control of Ace, one of the 14 characters to play as in Type-0 and go through a very brief, but highly informative tutorial. The basics of the game are really simple to pick up, but the tutorial also warns to use a strategic approach depending on the flow of battle. The combat system employs a hotkey set of commands at the player’s disposal. The commands vary from basic combos, evasive maneuvers, and even powerful spells. Final Fantasy Type-0 offers an innovative feature to the game, the kill sight feature. A kill sight occurs when the player’s target reticle flashes red to allow them to gain an instant kill on their enemies. This ability is exceedingly crucial to master when one is surrounded by a horde of imperial soldiers. However, your assailants are also able to utilize instant kills so tread cautiously. Ace performing an instant kill. The game remains true to its namesake by returning with summoning spells, but there’s a twist to summoning your monster. Instead of your summoned guardian performing a single attack on your foes, you are able to play as the monster and use its powers for a brief period of time. You get to sample the satisfaction of wielding a monster’s might by playing as Odin in the final tutorial. Players can also freely switch between any of the three members of their party to indulge in unique fighting styles until they find their ideal “main” character. You can even form your dream team at home base or on missions once you’ve reached a save point. There’s also a reserve list of characters to add to your squad should you and your allies fall in battle, but once all of your reserved members have fallen, it’s game over. Chocobos return as a means of expedited transportation should your travels outside the academy be long. You can even breed and nurture your chocobos to keep your flock abundant. Another interesting trait this game offers is the ability to reclaim fallen territories by leading a small army. This occurs when the player is prompted to eliminate the enemy influence on their land and engage in small-scale war. Once the enemy base is weakened, players will engage in defeating the enemy commander, thus liberating the town. After the town is freed, you are then able to shop at your own leisure. As enjoyable as this Final Fantasy title is, there are only two setbacks that could leave this tale less enchanting. For starters is the incredibly long introduction to the game. I have no problem with the opening cinematic because it sets you up for the story, but the only frustrating part is whenever a new scene occurred, it led to the anticipation of indulging in the game’s brutal combat only to be transitioned to another scene continuing to display the carnage of war. With patience for the long-awaited gaming experience, Type-0 definitely proved to be a challenging, yet entertaining take on the Final Fantasy franchise. The other setback is the voice acting. For some characters like Ace and Queen, their voices are fitting for their roles, but as for the others, some of their voices felt forced and lacked emotion which left me disenchanted to play as them. If you have a preference for the original Japanese voices, you might find their voices to be more pleasant. As for the graphics, the captivating high definition detail makes it hard to believe this game was originally made for the PlayStation Portable. Let’s not forget the delightful musical scores that appeal to the player’s emotional state depending on the in-game encounters. There hasn’t been a Final Fantasy soundtrack I haven’t enjoyed! Overall, Final Fantasy Type-0 proves to be an enthralling game with extensive hours of gameplay that challenges players to strengthen their parties and defend their homeland. With features such as the ability to customize a player’s dream team and play as summoned monsters, Square Enix’s RPG remains true to its name to keep players entertained with its compelling story. Once you get past the long introduction and dry voice acting, it’s a great game to play on all difficulties until Heavensward and Final Fantasy XV hit the shelves.